Daryl "Flash" Basadre (10W-1L-1D,7KO's) of General Santos City will face veteran Julius Alcos (24W-13L, 4KO's) of Cebu City in the main event of a fight card set at the Lagao Gymnasium in General Santos City on March 20. They will dispute the vacant World Boxing Federation (WBF) superflyweight title. Promoter Jim Claude Manangquil informed philboxing of this match-up. In 2012, Basadre held the WBF Asia-Pacific flyweight title. This year, he knocked out veteran campaigner Nelson Llanos in one round last January. Basadre’s only loss was by 6th round KO at the hands of Thai Suriyan Sor Rungvisai. Last year, Alcos lost a unanimous decision to Amnat Ruenroeng of Thailand who now holds the IBF world flyweight title. 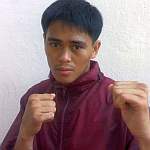 Alcos also lost to world ranked Froilan Saludar on points but he bounced back by knocking out Rowel Garcia in six rounds last December. Also set to see action are Jason Canoy of Cebu's Omega gym who will fight Ronerex Dalut of Gensan (10rds), Raymond Tabugon of Cagayan de Oro VS. Michael Rodriguez of GensaN (8rds), Jordan Catubay vs Rowel Garcia ( 6rds), Reymart gaballo vs Mike Kawsing (4rds). This card is presented by JM Promotions / Sanman Promotions. Manangquil also extended his thanks to Mayor Ronnel Rivera of Gensan and Councilor Brix "Liklik" Tan and Lonsdale boxing apparel.